The HS Series remote control encoder and decoder ideal for one-way remote control and Remote Keyless Entry (RKE) applications requiring the highest level of security. The series uses CipherLinx®-encrypted remote control technology, which is based on a core algorithm developed by the United States National Security Agency (NSA). The encoder and decoder also offer numerous innovative features, including up to 8 data lines, multiple baud rates, individual "button level" user permissions, an optional keypad PIN, encoder identity output, low power consumption, and easy "programming-free" setup. When activated, the encoder records the current states of its eight inputs and creates a highly encrypted packet. This packet is output as a digital data stream. This data can be sent to a decoder by RF modules, infrared link or even a wire. The decoder checks the received packet to make sure there are no errors and decrypts the data. If everything is good, then the decoder replicates the encoder’s input states on its outputs. These outputs are connected to whatever circuitry is required by the application. One of the key features of CipherLinx® encrypted remote control technology is that it will never send or accept the same packet twice. This alone makes it more secure than "rolling code" type devices, which could repeat packets multiple times. Furthermore, CipherLinx® changes codes on every packet, not just every button press. With a 40-bit counter, it would take over 890 years to run out of valid packets. An 80-bit key provides a high level of security. The key is created by the user, so there are no records of keys or “seed values” that could be compromised. An 80-bit integrity check means that the likelihood of an invalid transmission being accepted is 2-80. An optional PIN on the transmitter helps to secure the system against the theft of the transmitter or keyfob. The HS Series can be configured to allow only certain encoders to activate certain decoder outputs. This allows the creation of user groups and relationships rather than an all-or-nothing activation. 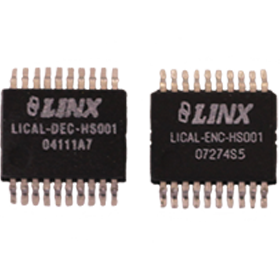 Housed in a tiny 20-pin SSOP package, HS Series parts feature low supply voltage, current consumption, and selectable baud rates. The protocol was evaluated by Independent Security Evaluators (ISE) and they concluded that “…the CipherLinx® protocol in the HS Series is well-designed and is an excellent choice for applications requiring a secure unidirectional link.” The compelling combination of security, features, and ease-of-use makes the HS Series the logical choice for all high-security RKE applications.